I'm all about finding ways to save money, especially these days as I'm pinching pennies to pay for Aiden's summer camp fees. Sigh. Check my Facebook status from this weekend if you're not sure what I'm talking about. That's why I love corners of the web like Coupons.com, which offers great coupons for pretty much everything on your shopping list. In fact, I plan on printing out as many coupons as possible this weekend when I go grocery shopping. Don't be mistaken, I'm in no way an extreme couponer, but there are deals to be had and money to be saved. And I shall have those deals and save that money! And check this: Coupons.com is giving away four (4) incredible prizes. Four! 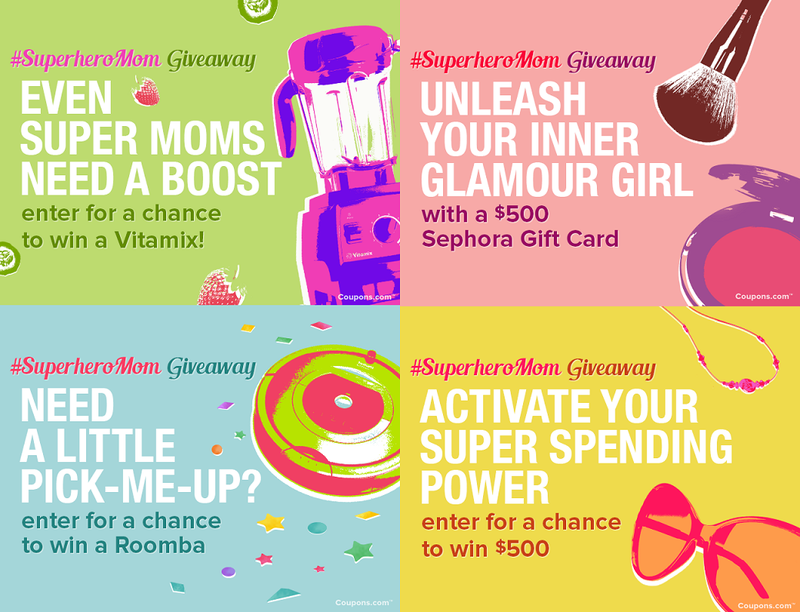 You'll be able to win a Vitamix, a $500 Sephora Gift Card (one of my fave places! ), a Roomba, and/or $500 Cash! It would quite literally be super dope and amazing to win one of these prizes for Mother's Day -- either for yourself or for a special mom in your life! It's the final push till the end of the school year (27 days until my students and teachers are off for summer break, but, um, who's counting?! ), and this delicious single momma is all about making my life simple and easy. Especially in the kitchen. (Hello... breakfast for dinner, anyone?!) Especially with drinking/eating my fruits and veggies on the go. Enter smoothies. Enter a great blender from Williams-Sonoma. Enter a simpler life. Score! To get started on making things simpler for yourself in the kitchen, enter the giveaway! The contest ends May 19th. Just found your blog from the Giveaways and after reading a post, I am going to follow your blog to read more . . Enjoy your Life!